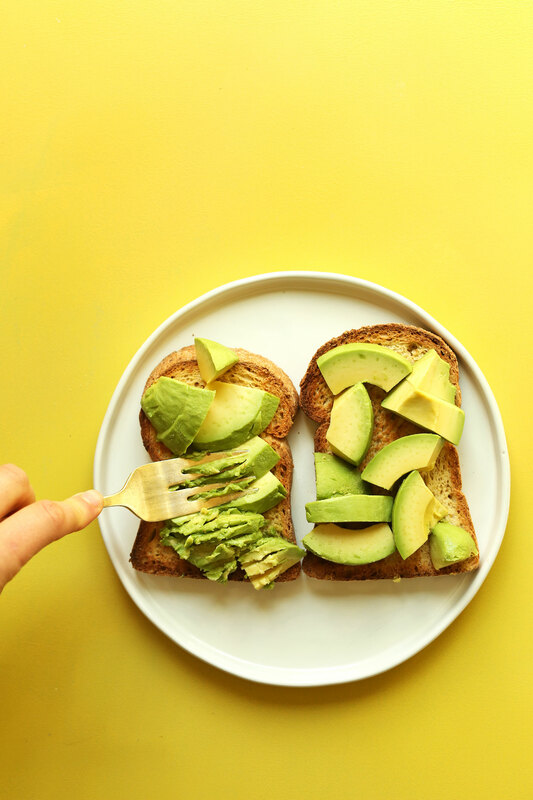 I wanted to share this 5-minute, 3-ingredient recipe because it includes some tips on my favorite gluten-free breads, as well as my tried-and-true methods for keeping avocados perfectly ripe for up to 3-4 days! See the recipe notes for all the details. Plus, I find the topping combinations to be simple but spot-on. Here’s the deal. Toast bread, add avocado, smash. SO FUNS. Then top with my go-to vegan parmesan cheese and a little red pepper flake. This combination is insanely delicious. Trust! It’s buttery from the avocado, salty and slightly cheesy from the parm, and spicy from the pepper flake. Major swoon. If you try this simple, nutrient-packed breakfast (or snack), let us know! Leave a comment, rate it, and don’t forget to tag a photo #minimalistbaker on Instagram. We’d love to see what you come up with. Cheers, friends! 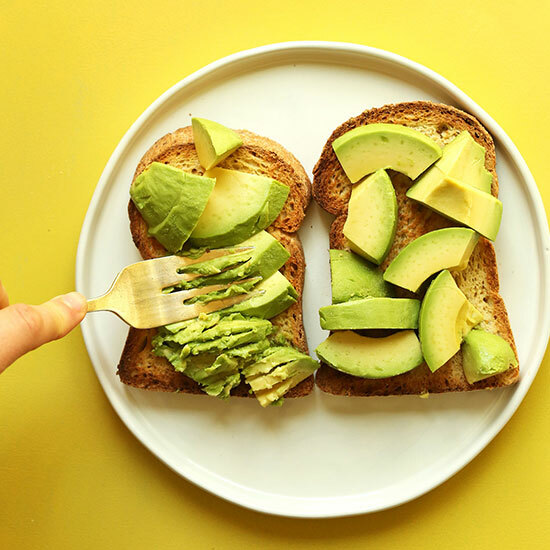 My go-to, vegan, gluten-free avocado toast! Just 3 ingredients and SO much nutrition and flavor! The perfect plant-based breakfast or snack. Toast bread in the oven or toaster. Top with ripe avocado and use a fork to smash. Top with vegan parmesan cheese and (optional) red pepper flake. Eat, repeat, enjoy! *My two favorite gluten-free breads are Udi's Whole Grain Bread, and a Portland brand called New Cascadia (which is dairy- and egg-free)! Udi's does contain egg, so if you don't do eggs, I'd recommend trying to order some New Cascadia or seek out local bakery options. *To keep your avocados in perfect ripeness, buy when nearly ripe. When ripened (soft to the touch), slice and use. Then store leftovers in a plastic bag with the pit still intact. It should stay in the refrigerator for 2-4 days! Slice off any brown edges before use. *Nutrition information is a rough estimate calculated with lesser amount of avocado and both of the suggested toppings. Wow! So simple and so delicious! I already keep your parm recipe made up in the fridge, so I could make this so quickly. Thanks for sharing!!!!! So glad you enjoyed it, Tricia! I’ll replace Parmesan with nutritional yeast, and see how that works. I eat avocado toast every morning! I smash some avocado, sprinkle turmeric and some black pepper for maximum absorption. I love it so much. Made your avocado toast this morning. It was wonderful. If you have not yet tried it, try Canyon Bakehouse Gluten Free 7-Grain Bread. It is 100% whole grain and tastes as close to regular bread as we have found. See your email in Instagram for detailed comment. I picked up an avocado from Wal-Mart last night just to try your avocado toast “recipe” this morning! We hope you love it, Christine! Yummy! I normally put sriracha on avo toast and it kind of overwhelms the whole flavor. This was a nice change! Just a little spice in certain bites. I’ll be making this again. Love it! Simple quick and delicious. Whoop! Glad to hear that, Pooja. Another great topping in place of the vegan parm is Nutritional Yeast and Gomasio – yummy!! why do you recommend gluten-free bread? We recommend it for people that cannot have gluten, otherwise feel free to use the bread of your choosing! Thank you for expedient response. I just tried this recipe this morning and it was so amazing! I was a bit skeptical of the red paper flakes but they add such a nice flavor. This is definitely going to be one of my new go to breakfasts. Gurl, this was great, I’m not even vegan! I’m 41 and never tried an avocado until recently….well, I love them! 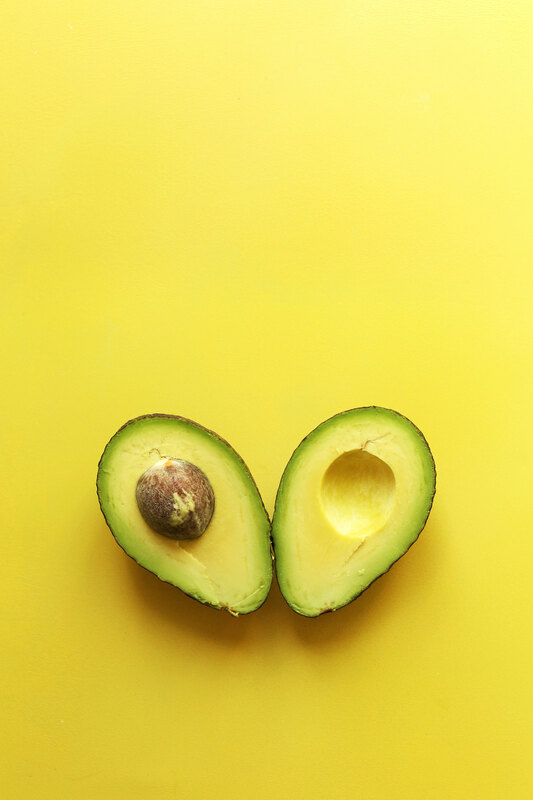 I came upon your recipe by searching avo recipes and I must say it is such a beautiful, simple and delicious way to get my avocado fix. Thanks! then pile it on lightly buttered sourdough toast. The flavors all blend to make something delectable. I guess to make it vegan you could omit the butter?? I will however look forward to trying yours everyone else can’t be wrong! Yes, or using a vegan butter will make it vegan! Fantastic! I have never thought of including Parm cheese. The combo of cheese and red flake is PERFECT; no salt/pepper is needed. Thank you! I used La Brea GF bread, which is the closest in taste and texture to white bread. It was delish. I never would have used parmesan. Buy lots of avocados on sale, mash, and freeze. Thaw in microwave. Can’t tell it was frozen! Tip: freeze in thin layer in Ziploc for easier dividing into portions. Will using non vegan parmesan have it turn out the same? Hi Dm! You can use non vegan parmesan! I like mashed avacados with my turkey and tomato sandwich.The avacado takes the place of mayo. Smoked paprika is also amazing on avo toast! Am I reading this incorrectly? You refer to it as “vegan” but then use bread containing egg? This sounds great! I’ve been making with garlic salt and red pepper flakes, and topping with a sliced boiled egg over Dave’s Killer Bread 21 grain. I will have to try the Parmesan! I did half cashew half pistachio for the parm. It was legit. Add Frank’s hot sauce! Yum!! I’m a big fan of Happy Campers GF bread in Portland, OR. Tastes just like ‘real’ bread. I’ve also come to appreciate avocado late in life. Love it on top of scrambled eggs with taco sauce or in a fresh spring roll with tofu/jicama/cucumber (and a mean cashew butter/chili sauce mix)! So easy, tasty and beautiful! Thank you! I recently learned a better way to make avocados last longer after slicing- store in fridge in a container with red onion. It works! I’m in my late 40s, and only just tried avocado for the first time a couple years ago. Man, I got a lot of catching up to do. They are AMAZING. I like to smash up half an avocado with tuna and make a sandwich. Tasty, easy, and better for me than my usual tuna sandwich. Can’t wait to try this. Especially the red pepper flakes. I bet that is a wonderful combination. I made this with quinoa instead of toast and it’s quite delicious! ? So good and so easy! I also tried it with some hummus on the toast first, then added the avocado mix for some protein. I absolutely love avocado toasts so much. I love your recipe, it’s really cool. I have some of my own so head over to my blog to see what ingredients I use :) I dedicated a post just for that. As someone who has firmly believed they hated the taste of avocado, let me just say I freaking love this! Suffice it to say avocado is now going to become a permanent item on my grocery list. I want to eat this for every meal. So good! I love avocado toast, and I usually eat it with hot sauce. But this receipe takes it to a whole new level (and I didn’t even know there were levels to avocado toast!) The vegan parm + red pepper flake is perfect! 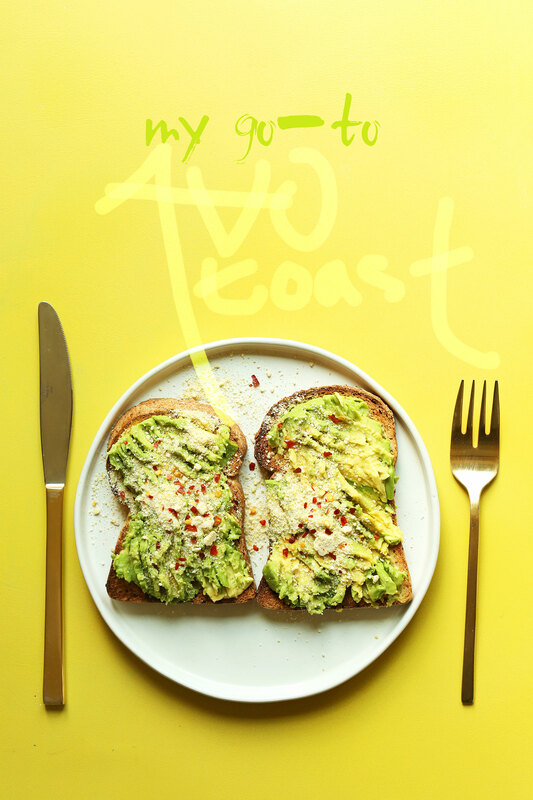 Best rendition of avocado toast – I made it with the white bean and tomato soup from this website and served it for dinner guests. Everyone was in heaven! My life is changed by this blog – please keep the recipes coming, especially dinner ones. Thank you Dana! Oh also, does your book have different recipes than on the website? Tried this recipe 4 days ago and have been eating it every morning for breakfast since. So easy and so good! Any suggestions for a low fat version. Any thing cheesy, vegan or not is off my menu. Feel free to leave the vegan parmesan off Jennie! Hi, where do you get organic nutritional yeast? Also some website states it is not vegan but vegetarian. Which one is true? So confused. Hi Kat! We usually get nutritional yeast from the bulk section at our local market, but if you’re having trouble finding it, order it online! Nutritional yeast belongs to the fungi family, so I consider it to be vegan, not sure about your other sources! Love this, simple but creative. Thank you for all of your delish recipies! UDIs gf bread used to be my favorite until I tried Schar honey whole grain. So good!! Thanks for posting. This is my go to as well. I put a slice of vegan cheese on the bread, top with the avocado, sprinkle with black salt and have another slice of vegan cheese on the other slice of bread. Pop in the toaster oven till the cheese looks like it’s starting to melt and wa-la! Deliciousness!!!!!!! Avo toast is one of my favorite things in the world! I love the Ezekiel, sprouted 100% whole grain bread and the Ezekiel sprouted whole grain raisin bread. They are not gluten free, but they are made with freshly sprouted live grains and contains no flour! This bread is also organic! I eat this toasted with peanut butter or avocado for breakfast as well! Paired with some fruits and it lasts me for hours! Always have loved ‘avocado toast’ til gluten intolerant; my sub is Wasa Sourdough Rye as the fermentation apparently helps! 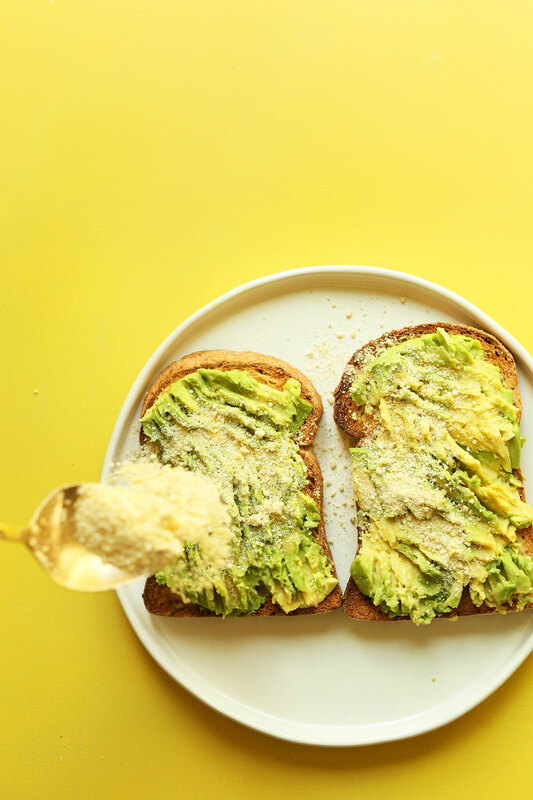 Haven’t tried the avocado/toast yet, but made your Parmesan cheese=love it, it’s fantastic. Use it on lots of things! That looks reeeeally good! We prefer Udi’s bread too. Whole Foods has a decent gluten-free loaf as well, but it’s a little crumbly. I’m definitely trying avocado toast for breakfast tomorrow! I have made a slightly different version of this before I saw your recipe. Vegenaise, sliced avocado, sprinkle of lime juice and red pepper flakes. 1/2 avocado per piece of toast. Looking forward to trying avocado mashed! Easier to eat. Will keep higher amount of avocado, as I love it so much I eat it out of shell with spoon. Thanks for the GF bread recommendations, and including use of egg info for those of us who don’t eat egg. I’m new to your site and excited to have found you! Trader Joe’s GF breads are pretty darn tasty! Their raisin cinnamon has become my go to fav for breakfast toast. Haven’t yet tried their other GF options. Also from Trader Joe’s is my absolute fave. 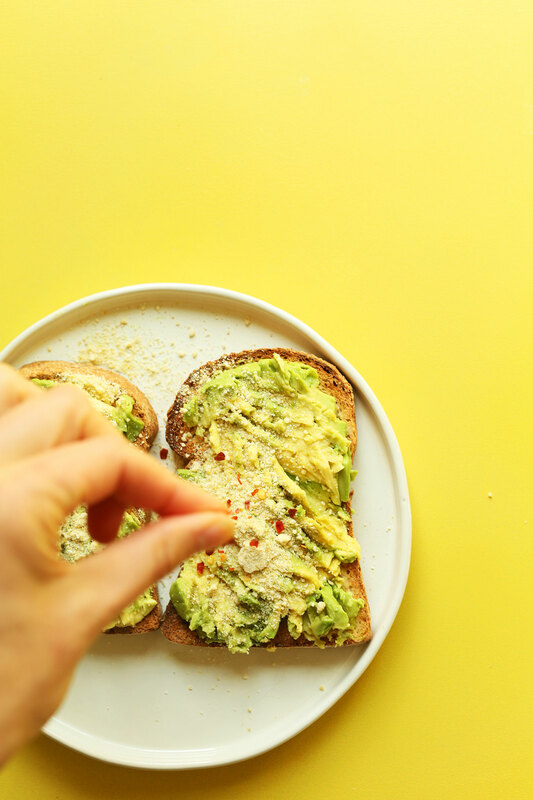 I start every day with their baby avocado mashed on crunchy toast with their chili lime seasoning. Perfect! They sell bags of perfect tiny single serve avocados. Leftovers turning brown problem solved. The chili lime seasoning is from their spice section and is great on many things (think popcorn). I’m going to list an alternative way I do this same thing because that’s what everyone in the comments does on food blogs. Nvm, I like this exactly as is. Thanks Dana. -Z.
Whoever says avocado toast isn’t a recipe CLEARLY has never brunched before. I LOVE chili flakes, turmeric, pepper, scrambled tofu and spinach on my avocado toast! Yum, this is really really good. I am having this for my breakfast as I key this message. Love your minimalist recipes and have shared some of my favorites on facebook with my friends! Keep them coming…. I love marmite, tahini, smashed avo and sesame seeds on crunchy toast (or rice cakes). YUM! I just put half an avacado in the fridge wondering how I would eat it & what do you know I see this lovely recipe! Yay! My husband and I have a standard Saturday-morning-brunch-at-home arrangement – we’re starting a business together and Saturday brunch is our main planning time (because whyonearth would you not have a business meeting over amazing food, always). Avocado is so often on the menu. I might surprise him with this one soon! Amazing recipe! Avo toast is my all time fave! I enjoyed this recipe very much. I am also a fan of Udi’s bread. When you mentioned New Cascadia bread out of Portland, are you speaking of Maine or Oregon? I live outside of Portland, ME and haven’t seen this bread yet. Thanks for all you wonderful tips too!! OMG!!! I think I am addicted! Excellent use of avocado. I would only add fresh-cracked black pepper. Have you tried Three Bakers bread? They have several great kinds (including some super seedy and grainy types), and in my opinion, blow Udi’s out of the water! No but it’s on my list! Just made this after my morning run!! Absolutely delicious :) Love Udi’s bread! Thanks, Dana! I’m partial to seeded breads right now – I’ve got a delicious rye bread made in a Polish style from the supermarket ^_^ Never thought of pairing avo with some vegan parmesan before – thanks for the tip!! So delicious, I do the same, but use lemon juice and black pepper. I have it almost every single morning for breakfast. I can’t wait to try this variation out! Yum! I love putting jam, avocado, and a little sea salt. I also love the WF gluten free bread. Thanks for posting a seemingly too simple to post recipe. I just had it for lunch and it was so delicious! I wouldn’t have thought to put the vegan parmesan on the avocado. I had some handy because I am making the alfredo tonight! Can’t wait to try it. Thanks for all the great recipes! Really nice, I added some cayenne to kick it up even more. Helped my sinus headache go away. Sounds really good. I am wondering, and alternative can also be to replace the vegan parmesan and red pepper flakes with, nutritional yeast and chilli flake #fire – Thanks for the recipe. Wooww….it is looking damn yummy. Delicious & Simple! Surprisingly, I preferred the pre-grated, store bought Parmesan (in a container) to my fresh grated Parmesan Reggiano in this case. For a variation on this, I like to use Tabasco sauce and cook an egg in the center. Pepper flakes!!!! Yummy I’ve added tomato when I eat avocados. I’ll have to try the parm now?? New Cascadia is a godsend. Nothing else compares – especially for those of us who are vegan and can’t eat Udi’s or Franz. We buy a loaf and pack it when we travel. There is no substitute. So yum. ? Right? I’ve been enjoying it so much! Eyeing their cinnamon raisin loaf next. Don’t get me started on their baguette … ? Just stumbled upon this recipe and saw your mention of New Cascadia. I’m from Portland and love love love New Cascadia! My husband and I are gluten-intolerant and allergic to dairy and egg, so it’s perfect! Honey Gold our favorite, and we visit their in-town cafe (entirely GF) regularly. Try avocado, fried sliced tofu, srichacha sauce – amazing! Could you use Nutritional Yeast instead of veg parm? Agreed! Then just sprinkle on a little salt, too. So easy! Aw….one of the things I liked about the email subscription to your blog was that we didn’t have to click on a link to have the recipe pop up in another page– I can’t see them otherwise (pop-ups like that are blocked at where I work, and I don’t have internet or a smart phone to see them at home). Is this a permanent change? Please say no, and go back to having the full post show in the email! By the way, either Serious Eats or Food52 did a really good “science experiment” earlier this summer where they compared multiple ways of keeping avocados from turning brown. I can’t find it now but if anyone wants to look for it, it was a good read! Born in CA so I love avocado! It is a requirement isn’t it? LOL You live in or close to Portland? I’m assuming OR. That’s the city I grew up in–Mt Tabor area mostly. Beautiful city! I live in the armpit of TX now! I’ve had toast/’cado many times but of course not with your parm sub. Sounds yum,yum, yummy! Grew up in Florida. Our Haas avacados are much larger. Now that I am in Kansas I am loving the California avacados. 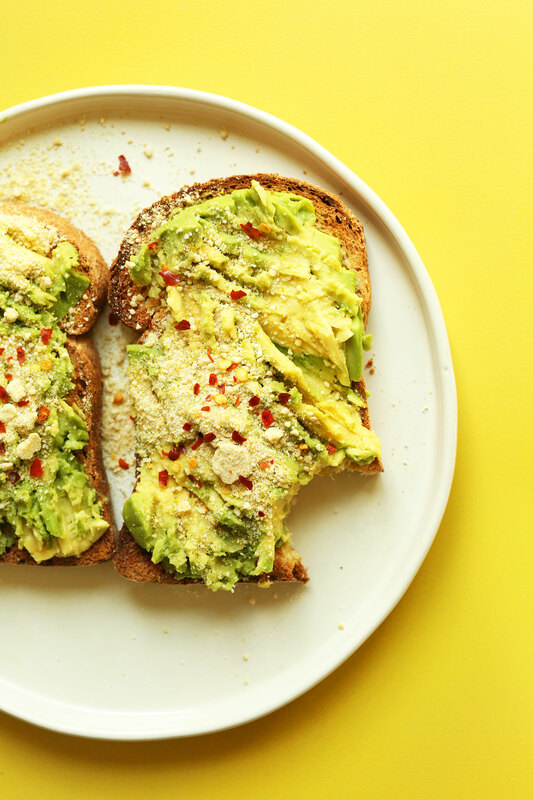 I like avocado toast and I like vegan parmesan, but had never thought of combining the two so I say it’s worth a recipe! Udis multigrain is my favorite GF bread. Tasty, soft, toast-able, easy to digest! Agreed! I keep going back to it. What about Ezekiel Sesame Bread…all organic, sprouted grains and delicious! This is what I use! !